Wielding skewers big enough to gore an ox and knives worthy of Benihana, waiters make the rounds at Souzas, offering diners succulent grilled beef, chicken and lamb. Part performance art, part excellent cooking, the eating experience at Burlingtons new Brazilian restaurant is worth the trip to its under-the-radar lower Main Street location. Souzas occupies the space in which Chef Kelly Dietrich used to run his catering operation and Kids Culinary Academy  a summer cooking camp for kids now located in Essex Junction. With their new venture, Dietrich and his Brazilian wife Edna provide a unique culinary experience that carnivores are sure to applaud. Dining out means many things to many people. Some go for the ambiance, some for the food, others for the cultural interest. Souzas combines all three with its rodizio  continuous service system. Think Dim Sum with skewered hunks of grilled food replacing the dainty dumplings. Souzas fixed-price, all-you-can-eat approach makes for interactive, gluttonous dining  dinner in the Brazilian tradition, featuring a seemingly endless parade of goodies brought to your table. We ate at Souzas twice within two weeks of its May 2 opening, for Sunday brunch and dinner. Brunch was the better value. Dietrich calls it a miniature version of his dinner menu, with such mainstream American fare as eggs, hashbrowns, breakfast sausages, French toast and pasta salad augmenting the grilled meat that stars at both meals. Churrasco  big haunches of animal flesh grilled on skewers  is a legacy of the gauchos, the cowboys of southern Brazil. After a hard days riding, they would find a cow, butcher it, impale large pieces of the meat and grill them over an open fire, basting with salt to add flavor. When the meat was done, they would slice off thin strips with a sharp knife and catch them with their teeth. 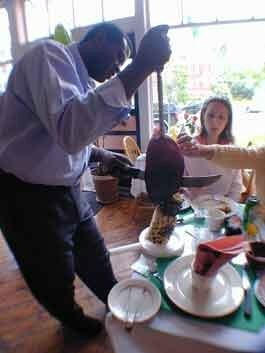 At Souzas, each grilled item was brought to our table by a waiter making the rounds of the dining room. Only males handled the knives, for some reason. After inquiring whether we wanted any of the item, he propped the point of the long skewer on a small plate, then carefully carved off thin, pink slices, which we accepted with tongs  no teeth catching required. The pork was outstanding. Juicy and succulent, it was one of the two best pieces of pork Ive ever had  second only to a friends freshly butchered pig. The moist and pink Turkey Bacon tasted like smoked turkey wrapped in bacon, although our waiter insisted that it wasnt smoked. The mozzarella cheese resembled warm little pillows, though the texture was more interesting than the taste. The marinated and salt-basted beef  prime rib and sirloin  and chicken were tender and flavorful. At brunch, the clearly Brazilian accompaniments were the most intriguing dishes, though not necessarily the best. Yuca, a root vegetable that dominates much of Brazilian cuisine, appeared at least twice in the meal. A plateful of what seemed to be canned, boiled yuca  served without any of the flavorful sauces that usually accompany it in Brazil  was rather bland and gluey. Farofa  a small, dry condiment of yuca flour mixed with onion, garlic and parsley, did little for my American palate. By contrast, the slightly sweet, peach-colored barbecue sauce was heavenly, especially on the hashbrowns. Rice and beans were enlivened with the addition of raw, mixed onion and garlic. Airy cheese puffs  not unlike the French choux au fromage  was excellent, as was a fruit plate with pineapple, dried ripe papaya, kiwi, melon and orange. Souzas offers pure fruit juices  cashew, passion fruit, guava and mango. The mango was the brightest, the cashew a bit strange. We were offered regular coffee at the start of the meal, and demitasse cups of high-test Brazilian espresso during the meal. The weak spot at brunch was dessert. The day we ate there, the banana cake was dry and the flan had curdled. When we returned for dinner, though, the flan was just right: It melted on our tongues. The best dessert at both meals was a puree of caramelized bananas with cheddar cheese, though it was hard to distinguish the bananas in the dark red, heavy concoction. All the desserts are extremely sweet, and fitting counterpoints to the savory main courses. At dinner the slightly wider selection of grilled meats  lamb, ham, chicken, beef sirloin and prime rib  came with a bland black-bean broth, for drinking or dunking bread, as well as zz, a green salad and various vegetables. The churrasco was again the best: perfectly cooked pineapple, sausages, pork, turkey, lamb, ham, chicken, chicken hearts, cheese, and cuts of beef. While most of the meats were excellent  especially the pork and beef  the lamb tasted a bit off. And I was less than wild about the chicken hearts; I couldnt help but think about the 25 chickens who gave their lives for just one skewer. A tomato-based shrimp dish was just OK, and the Fettuccine Alfredo was less than desirable. While there are certainly enough meatless dishes here to please vegetarians, and the menu informs that grilled polenta with marinara sauce can be prepared upon request, Souzas is basically carnivore country. Piped-in Brazilian music gives the place an upbeat, Rio mood, but its not clear why a television is so prominent in the dining room, unless maybe theyre planning to show Brazilian soccer matches. To help diners get in the mood, Xingu, an excellent thick, sweet Brazilian black beer, is served in a 25-ounce bottle  enough for two  for $4.50. Argentinian and Chilean red and white wines are also available, for $22 and $19 a bottle, respectively. The ratio of waiters to diners is high  almost one per two tables  and the smoothness with which the staff worked as a team to make the rodizio system flow was impressive. The menu suggests tips from 20 to 25 percent. This is pretty bold, but the staff does work very hard. At the very least, they should get hazard pay for having to carry around large knives with the business end pointed at their feet.